The only wild species of deer living in Pennsylvania is the Northern white-tailed deer (Odocoileus virginianus). Pennsylvania also has elk (Cervus canadensis), however, elk are not really deer, but only close relatives of deer within the same family -- in much the same way that dogs, coyotes and wolves share a common genealogy. The white-tail is quite numerous in the state, however, and over-population is a problem in many areas. Pennsylvania Department of Conservation and Natural Resources, Bureau of Forestry-Ecological Services sponsors several programs to reduce their numbers. Adult white-tailed deer are from 5 to 6.5 feet long, and stand between 32 and 40 inches at the shoulder. They are gray-brown to rusty-brown on top gradually fading to creamy-white underparts and insides of legs. The name white-tail derives from the distinctive white underside of the tail, which deer nervously flash when danger threatens. White-tails breed in the fall and give birth, usually to one fawn, but sometimes to twins in the spring. Due to hunting, predation, accidents and disease, they rarely live more than three years in the wild, though they can live upwards of 20 years. In October of 1959, the state of Pennsylvania recognized the white-tailed deer as “... a proud and noble animal possessing intelligence, endurance and character” and made it the state's official animal. The state also recognized the important historic role this species played in keeping Native Americans and early settlers alive. Both groups relied heavily upon deer for both food and hides -- the latter an important raw material for clothing, shoes and other necessary items. 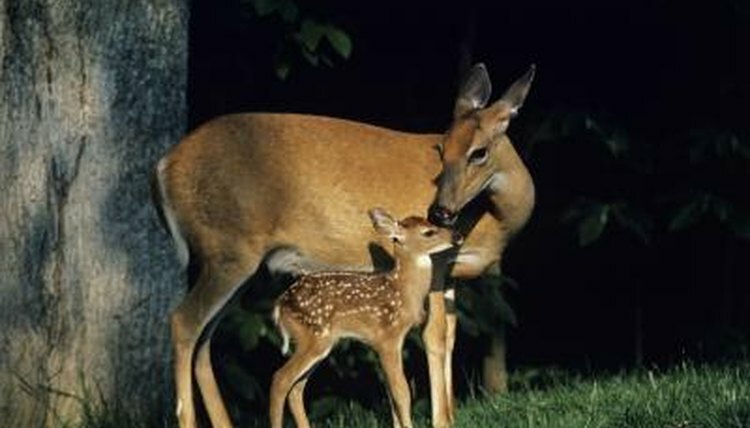 In the 17th century -- well before Pennsylvania became a state -- white-tailed deer were not numerous. Pennsylvania was nearly 100 percent forested in mature timber, leaving none of the shrubby edge habitat that deer prefer. As a result, the area was not prime white-tail habitat. Coupled with management by native peoples -- who hunted as necessity dictated -- and natural predation by bears, cougars and wolves also living in the state at that time, populations of both sexes were lower than today, and deer overall numbers likely at, or somewhat below, the ideal population densities the habitat could support. Until implementation of deer management practices in the early 20th century, anyone who wanted to could kill as many deer as he liked. No laws or regulations existed to prevent tracking down and shooting every last deer, and unfortunately, that is nearly what happened. By the late 1800s, white-tailed deer were almost extirpated from Pennsylvania. In 1895, the state established the Pennsylvania Game Commission and began an intensive deer management program that included restocking herds with wild deer from other states, as well as instituting hunting regulations and official seasons. By 1930, deer populations in Pennsylvania not only rebounded, but exceeded historic records. From then until the present, deer management has evolved into a science requiring careful and constant evaluation to keep herds in balance with available habitat.